Well-Beyond, a new direct sales company, is hosting the two-day event to provide education on its growing line of targeted health & wellness and weight management solutions—which includes the world’s only healthy chocolate®—as well as to deliver direct sales leadership training. The beautiful and majestic Park City, Utah. “Events are where Leaders are born and where everyday heroes decide to go beyond mediocrity to greatness. Attendees will Learn to Earn and to Be Well. Do Good and Have More with Well Beyond,” said Co-Founder and CEO Jeremy Reynolds. Well-Beyond, a new direct sales company, is hosting the two-day event to provide education on its growing line of targeted health & wellness and weight management solutions—which includes the world’s only healthy chocolate®—as well as to deliver direct sales leadership training. 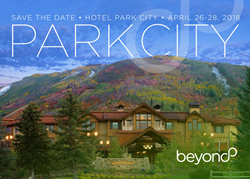 Learn to Earn will take place at one of the most beautiful mountain resorts in the world, Hotel Park City. In addition to acquiring new strategies for business success from leading industry entrepreneurs, attendees will have the chance to sample Well-Beyond products and understand the science behind their effectiveness. Well-Beyond’s Founders, Executive Team, and top company Field Leaders will also be on hand to meet and network with participants. Learn to Earn is nearly sold out with early bird pricing still available through March 31. You can purchase your tickets here. Well-Beyond develops targeted health & wellness and weight management solutions to change lives. Along with the world’s only healthy chocolate®, we deliver nutritious products for better sleep, enhanced focus, and endless energy. At Well-Beyond, we believe health and happiness go hand in hand. We exist to elevate the world from mediocrity to greatness by holding ourselves and others to our highest potential. This inspires us to go well beyond every day.